Home / Blog / Easter in Santiago de Compostela: What’s on? Easter in Santiago de Compostela: What’s on? Santiago de Compostela is the finishing point for all routes on the Camino de Santiago pilgrimage. 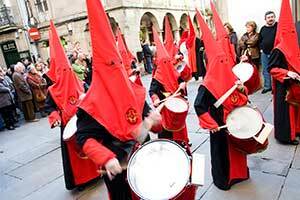 If you happen to find yourself at Holy Week in Santiago de Compostela you might be wondering what exactly is going on? What you’re likely to find is: streets full of people, seats set up for spectators, a lot of rather interestingly dressed folk and an air of solemnity about the city. Easter processions in Spain are quite the spectacle. A tradition that dates back to the 16th Century, processions take place in the week leading up to Easter Sunday, known locally as Semana Santa (Holy Week in English). During the processions, members of religious brotherhoods walk the streets dressed in penitential robes characterised by a large conical mask which covers all but the eyes of the wearer. The hood is designed to protect the identity of the wearer as they repent their sins. They may be seen carrying processional candles, wooden crosses, or even walking the streets barefoot, and, in some places may carry shackles and chains on their feet as penance. Whether you’re religious or not, Easter time in Santiago is a spectacular sight worth seeing. 21:00h – Procession of ‘La Virgen de los Dolores’ – Starts at: Church of San Miguel dos Argos. On Palm Sunday, you’ll see locals carrying branches of trees in their hands, these are in commemoration of the palm branches that were scattered in front of Jesus as he rode into Jerusalem. 10:45h – Procession of the entry into Jerusalem; starts at: Church of la Orden Franciscana Seglar. 11:30h – Procession of ‘La Borriquita’, procession of the little donkey; blessing of the branches and palms. Starts at: Plaza de A Quintana. 18:00h – Procession of ‘La Esperanza’. Starts at: Praza das Ánimas. You might notice that the members of this procession are on the miniature side. This is because the Procession of La Esperanza, or the procession of ‘hope’, in English is a children’s procession, those carrying the float are young girls. 21:30h – Procession of ‘La humildad’ (humility). Starts at: Church of Santa María do Camiño. 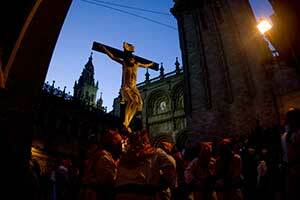 21:00h – Procession of ‘Santísimo Cristo de la Paciencia’ (of the patient Christ). Starts at: Convento de Madres Mercedarias. 22:30h – Procession of ‘La Oración del Huerto y Prendimiento’ (Jesus praying and captured). Starts at: Campiño de San Francisco. 19:30h – Way of the Cross. Starts at: Campiño de San Francisco. 23:00h – Procession of ‘Los Estudiantes’, the students procession. Starts at: Church of Orfas. 18:00h – Mass of the Lord’s Supper – Location: Catedral de Santiago. 19:00h – Procession of ‘La última cena del Salvador’, the last supper. Starts at: Campiño de San Francisco. 23:30h – Procession of ‘Jesús Flagelado’. Starts at: Praza de Santo Agostiño. 10:30h – Procession of the Holy Encounter. Starts at: Church of San Miguel dos Argos. 18:00h – Passion of Christ Mass with the Archbishop. Location: Catedral de Santiago. 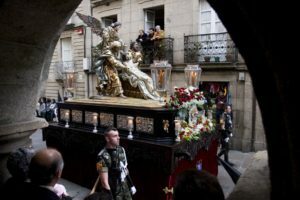 18:00h – Procession of ‘La Quinta Angustia”. Starts at: Church of Nuestra Señora de la Qui na Angustia. 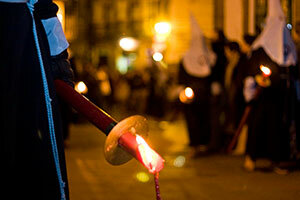 20:00h – Procession of ‘El Santo Entierro” (the holy burial). Starts at: Church of San Domingos de Bonaval. 23:00h – Procession of ‘La Virgen de la Soledad” (our lady of solitude). Starts at: Church of Santa María Salomé. 20:00h – Procession of ‘Los Hermanos’. Starts at: School of La Inmaculada. 10:30h – Procession of ‘El Cristo Resucitado’ (resurrection). Starts at: Church of San Francisco. 11.15h – Procession and Encounter with Christ the Resurrected. Starts at: Plaza de A Quintana. 11.00h – Procession of ‘El Santísimo Cristo de la Paciencia’. Starts at: Praza do Obradoiro. *Pictures courtesy of Turismo de Santiago. Aoife has an affinity for all things Hispanic. She has travelled the length of Spain, backpacked her way from Peru to Patagonia and packed in a trip to Cuba! When not travelling, you'll find her lugging her guitar around Dublin.